The 13-hectare park was created by sculptor François-Frédéric Lemot on the banks of the Sèvre Nantaise in the 19th century. 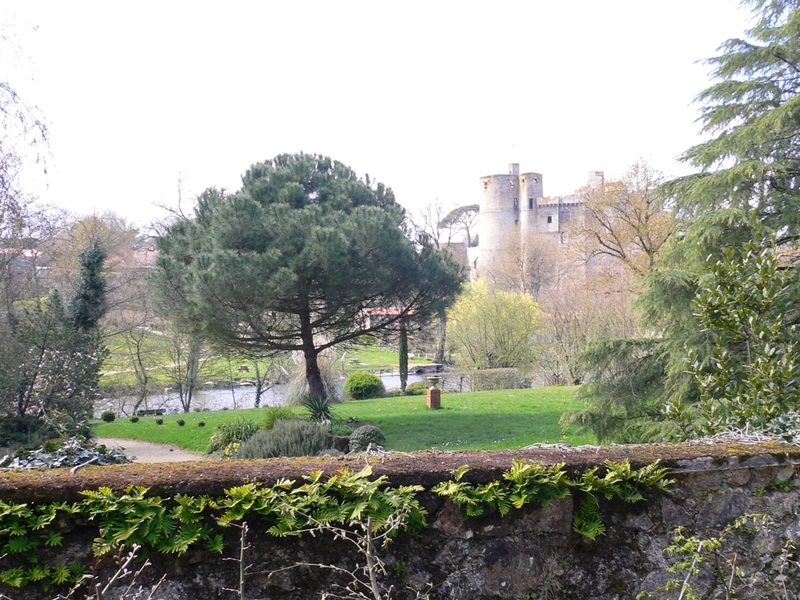 The pine trees, stone pines, buildings and statues in the picturesque park near the beautiful town of Clisson make it reminiscent of Italian landscapes. Designed during the first quarter of the 19th century, Garenne Lemot is part of the tradition of great picturesque 18th-century landscape gardens in France, which adopted elements of design from England, China and Italy for both their flora and their architecture. The 13-hectare park, which has protected status, was created by the sculptor and architect François-Frédéric Lemot. This artist, who had fallen in love with Italy and who was entranced by the picturesque banks of the Sèvre Nantaise river, created an ideal landscape in front of the gates of Clisson. Here, architecture is united with nature. Temples, columns, statues, terraces and stone pines accentuate the park’s steep slopes. “An Italian Dream” is the title of a permanent exhibition in the gardener’s house and in Villa Lemot. It presents the history of the park and its development over the years. Numerous theoretical works which appeared from the 1760s onwards deal systematically with all aspects of the art of creating gardens in such a way that they offer the strolling visitor unexpected and varied landscape scenes. Such scenes were designed to be reminiscent of ancient Arcadia, the lost paradise, which was also much loved by Jean-Jacques Rousseau. The Garenne woods, once the hunting ground of the Clisson nobility, are located opposite the mediaeval castle and have belonged to the state since the 1789 revolution. Approximately four hundred oak trees grew on the rugged terrain, which was covered in scrub. François-Frédéric Lemot bought the site in 1805 and decided to turn it into a place dedicated to art. It took several years to design the landscape. Building and planting went on for almost 20 years, between 1805 and 1827, the year when the sculptor died. The villa and its terraces are built on the edge of a hilltop plateau from which one overlooks the Sèvre river. Their location influenced all the work on the landscape and they form the central point where three magnificent avenues dating from 1807 meet. The gardener’s house was built to the west of the vegetable garden. The park entrance which faces towards the town and which is also near the gatekeeper’s house, was considered by Lemot to be “the most significant and most interesting” entrance – and it remains so to the present day when one approaches the garden from the town and crosses the bridge. It is the starting point for a walk along the Sèvre river which is accentuated by architectural follies. Further follies erected on land acquired by Lemot on the left bank of the river (obelisk, column of Henry IV, Temple of Friendship) complete the Italian-style landscape creation. Later, the visitor can enjoy the panoramic view from the villa terrace. Lemot himself was involved in designing this view and incorporated existing features such as the castle at Clisson and the chapel of the Templars. Two hundred and eighty trees were planted from 1806 onwards and one thousand poplars were planted along the bank and on small islands in the Sèvre in 1807. It took a year to clear the scrub and the blackberry brambles. Lemot introduced ferrets in order to eradicate the rabbits, which were eating the young shoots. He also planted lilac trees and hazelnut bushes along the smaller paths. The vegetable garden, which has a round water basin at its centre, was created in 1807/1808. A tree nursery for pine trees, stone pines, spruce, acacias, sycamore maples, poplars, plane trees, weeping willows and fruit trees was established here at first. Walnut trees, horse chestnuts, sweet chestnuts, larch trees, Lebanese cedars, and maple trees were planted. Evergreen conifers alternate with linden trees, chestnuts and elms surrounded by brooms along the avenues leading to the villa. Hedges of lilac, acacia and hornbeam complete the scene.